I went out to Hiroshima. It takes less than 2 hours from Kyoto to Hiroshima by Shinkansen, making it possible to return within the day. 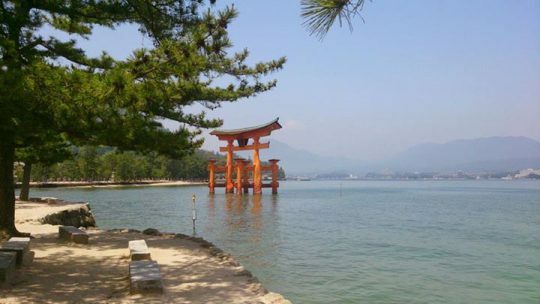 Some photos of Miyajima (Itsukushima) and the Atomic Bomb Dome. And then there were the unforgettable Hiroshima-yaki pancakes. I imagined it would be just like having Kansai-style okonomiyaki pancakes, only with some yakisoba fried noodles on top, but I found out that they’re made entirely differently! It looked like it might be too much, but the the noodles were thin and not heavy. I had no problem finishing it.